There is nothing more calming than view of the sea right from your window. 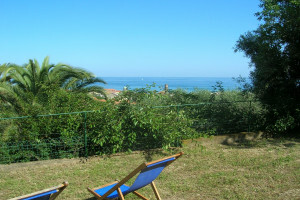 Choose one of our holiday rentals with sea view in Liguria and spoil yourself watching sunsets that will take your breath away. 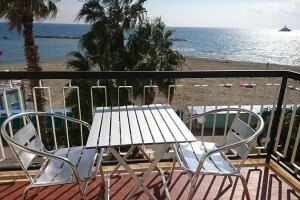 Wake up in the morning in your holiday apartment and the view of the sea was not a dream! 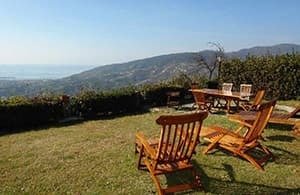 As a start to your day over here, you will enjoy the breathtaking view over the lovely Ligurian landscape right up to the coast and the blue scintillating Mediterranean sea. 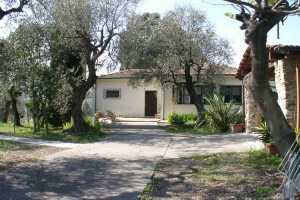 garden, Parking lot, balcony, terrace, BBQ, playground, outdoor furniture, Sat/TV, Washing machine, Dishwasher, 5 + 2bedrooms(s) Idyllic, well furnished apartment located on a quiet slope within an olive-grove, Two bedrooms Playground for children Private parking terrace Garden with barbecue Small swimming-pool. Since the foothills of the Alps in Liguria stretch right into the sea, holiday apartments and houses were built here on the mountain slope near the coast. These fascinating surroundings enable the vacationists to enjoy the combination of mountain panorama and the azure blue horizon of the Mediterranean Sea, the extension of Cote d'Azur on the Italian side. The coastline stretching from Ventimiglia to Cervo is in this regard described as BlumenRiviera. Adjacent to it is the PalmenRiviera, which is not less remarkable in its beauty - with rugged rocky coastlines and the winding coastal street. In most cases our guests therefore have wonderful views of the sea from the terrace or the balcony of their holiday house. 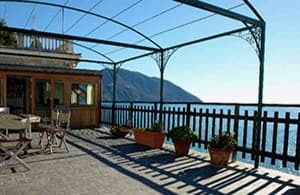 The interplay between mountains and the sea in Liguria is simply unique. Surrounded by green mountains, colorful Ligurian house fronts and the azure blue sea, you will experience a unique play of colors in Liguria. You should definitely always have your camera with you while on vacation here, so that you can capture those impressions. 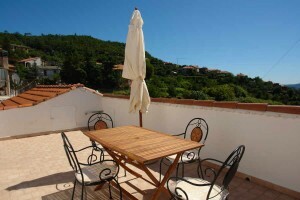 The wonderful view of the sea will quickly lure you to the coast and beaches of the Italian Riviera. 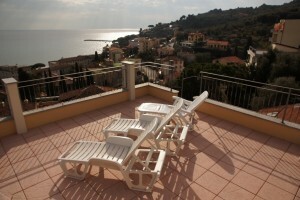 You can reach the nearest coastal resort in a few minutes from your holiday apartment. 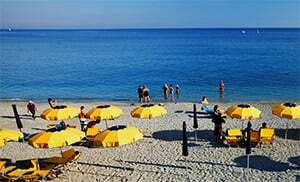 Once there, you can spend the day by the sea, stroll through the historic town centers of the various small localities and in the process enjoy Italian flair. The healthy seawater caters for a welcome and refreshing cool bath, particularly on hot summer's days. If you want to engage yourself actively, you can set off on a bicycle tour along the sea or go on a tour of the coast from the sea by taking part in a sailing trip. Thereafter you can visit one of the famous Italian markets or enjoy the sun at the beach while having an ice cream. You can plan how to spend the evenings on the BlumenRiviera in many different ways. Italians usually meet in the early evening in the numerous restaurants found in coastal towns for what they call Aperitivo. There you will be served small snacks as you enjoy your drink. If that arouses your appetite, you should then go to one of the numerous restaurants serving traditional dishes. Be it in Imperia or in other provinces of Liguria, you can experience a culinary surprise in all those places! The conveniently furnished kitchen in your holiday apartment also beckons you for a cooking session together with your family. During the summer months in particular, evening shows will lure you to make a late trip to the coastal resorts yet again. … is very simple! 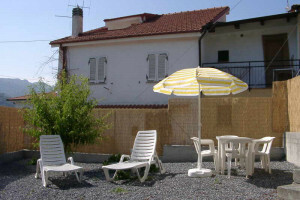 We have selected the holiday houses, holiday apartments and Agriturismi carefully for you at the holiday location. From the detached holiday house to the holiday apartment, with a wonderful view of the sea, there is something for every taste. 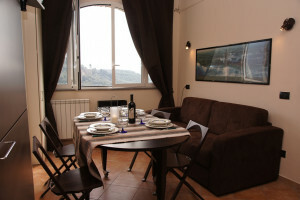 Simply remember when you are searching for available accommodation, and after you have entered the date for arrival, duration of the vacation, number of persons and number of rooms required, open the search window for "more options" in the search results list and to put a checkmark against "sea view". 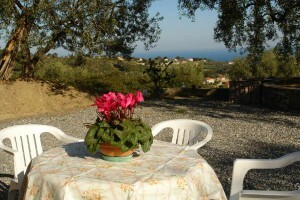 You will then be shown all available offers with a direct view of the sea or at least with a wonderful view over the valley up to the sea. Is there anything more beautiful than to admire the sunrise over the sea or to have one’s breakfast with this fantastic view? Of course: Nothing can beat a splendid night with a full moon and a view over the glittering sea, while you are in the company of your loved ones!